Since the last post, I’ve been bouncing back and forth between two knitting projects. One is the project I unceremoniously dumped the Turn-A-Square hat for and the other is a secret squirrel project that I can only speak vaguely about. The day after my last post, Knitscene’s Fall 2011 edition was released. I remember back in the day when I used to stake out the local Newsagent or a now-defunct chain bookstore and wait weeks, or even months, for imported knitting magazines to be stocked. Now I just download the magazine from Zinio on the day that it’s available in its country of origin. Such an age of convenience we live in (a statement I’ll no doubt laugh at in 5 years time). If you’re a fan of Amy Herzog’s designs and/or her fit to flatter series, I recommend having a look at this edition of Knitscene. She’s the subject of a designer’s profile, and there are quite a few of her designs featured. Two that piqued my interest were the Cornsilk Pullover and the Pinstripe Pullover. I had suitable yarn in stash for the Cornsilk Pullover, so that was that. Since taking this fairly insipid photo, I’ve finished that piece (the back) and have started on the front. I’m really looking forward to wearing it, but as it’s mostly stocking stitch, it’s not a really an interesting project from a blogging perspective. The secret squirrel project was started after the Bendigo Sheep and Wool show and uses yarn purchased at the show. I’ve never had the pleasure of knitting with Pear Tree Yarn, but it was very difficult to resist when they were selling it for a song in Bendigo. 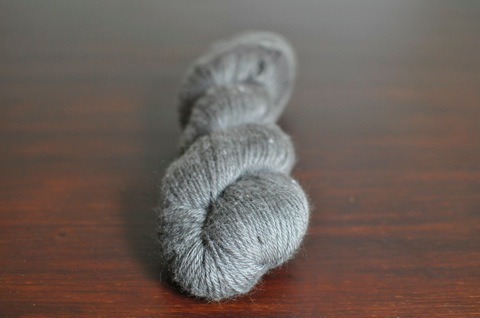 After a little bit of to-ing and fro-ing over colours, I picked up a kilo of grey Pear Tree 8ply specifically for this project. It’s really lovely yarn to knit with, but I have had a couple of hiccups with it. 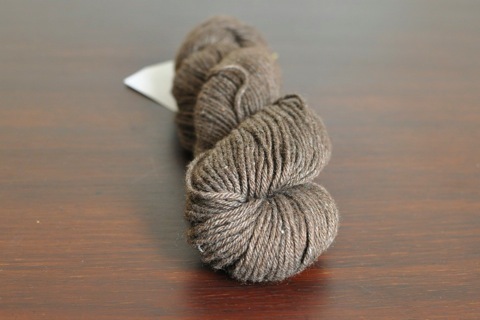 It’s Bison Bamboo from Ixchel Yarns and it’s unbelievably soft. The yardage on it is really impressive (around 160m per 50g), but I bought another skein to give myself a bit more freedom when picking a pattern. Initially the plan was to make a cowl, but there might now be enough to squeak out a scarf for Matt, to make up for the Turn-A-Square indiscretion. 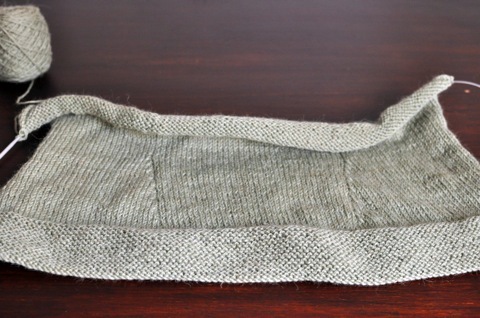 So far the frontrunner is the appropriately named Man scarf from fallmasche (rav link). I’m not completely convinced that it’s the pattern for this yarn, but as I’m not likely to cast on anytime soon, I don’t have to decide just yet. Hmm! Lots of yummy yarny goodness! Both yarns look lovely! And I love the way you think about projects, technique and the whole process- very smart girl. Thanks too for the link to the modified provisional cast-on- the more I see of Lucy Neatby, the more I love her brain. She has so many ways of doing things that are just easier and more efficient. It’s all looking very grey Emma, I reckon you should show us a picture of your finished red knee high socks, you know you want to! I’ve just checked out Amy’s stuff via your link and have had to fave the February fitted pullover! they are some really lovely yarn p0rn photos Emma. I know that Pear Tear yarn quite well as I bought some last year. When I pull it out I’ll have to make sure I got all the same weight! i got some of that pear tree at last years bendigo too, a kilo as well to be precise. i think mine was the alpaca mix, and i have found it so far to be quite loosely spun, as though it will come apart like cotton wool if i pull too hard. im still thinking about what to do with it. that cornsilk is a gorgeous pattern, and wil look stunning on you.